The Government of Canada recognizes that the cultural sector not only plays a vital role in building strong and healthy communities throughout the country, but also makes an important contribution to our economy. Canadian Heritage’s portfolio organizations are an important part of our cultural, social, and economic lives. Together, they work toward the goal of providing Canadians with opportunities to celebrate and share our rich historical, cultural, and artistic heritage. As a Canadian Heritage portfolio organization, the National Film Board (NFB) offers services and programs that help us achieve these objectives. As Canada’s public producer and distributor of audiovisual works, the NFB has been a technical and creative innovator in documentary and animation. It is forging the art and entertainment forms of the future in groundbreaking digital productions that are increasingly recognized around the world. Through its online Screening Room, the NFB has succeeded in carving out a significant space for a Canadian brand in the global cultural sphere. The NFB’s evolving collection of stories reflects the full spectrum of Canadian experiences and narratives. The organization’s commitment to full accessibility to its works—in both official languages, in every part of Canada, and on every platform—has allowed it to reach out to Canadians in new and meaningful ways that encourage greater citizen engagement. Last fiscal year, for example, it launched a project called Unikkausivut: Sharing Our Stories. This initiative celebrates Inuit talent and culture, and uses digital technology to help preserve the language and history of the Inuit to create a lasting legacy for future generations. As Minister of Canadian Heritage and Official Languages, I am pleased to present the 2011-2012 Departmental Performance Report for the National Film Board. This report provides a detailed account of the accomplishments of the NFB over the past year and demonstrates the ways in which it fulfills its mandate, supports the priorities of our Government, and contributes to the strength of Canadian society. The year 2011-2012 saw us strengthening our leadership role in the industry as a creative laboratory of the digital future that produces and distributes ground-breaking audiovisual works. It was the year that our strategic vision and efforts in organizational renewal and economic modelling came to full fruition, despite the ongoing global recession and fundamental and structural changes to our cultural industry. We set ourselves the goal of being closer than ever before to Canadian hearts and minds, and we succeeded in demonstrating that audiences can retain an ongoing sense of excitement and anticipation for our projects. In the past year, 97 NFB original productions and co-productions were released—works created by both experienced and emerging filmmakers from a wide variety of regions and cultural and linguistic backgrounds. Several of our critically acclaimed feature documentaries, among them Léa Pool’s Pink Ribbons, Inc., Jennifer Baichwal’s Payback and Richard Desjardins and Robert Monderie’s The Hole Story, were screened in theatres. These and other important releases contributed significantly to a national dialogue about some of the vital issues facing Canadians. Our productions received more major nominations and awards than the year before. In the field of animation, two NFB shorts were nominated for an Academy Award: Wild Life, created by the Alberta animation duo of Amanda Forbis and Wendy Tilby, and Dimanche/Sunday, the professional film debut of Quebec’s Patrick Doyon, an alumnus of the NFB’s first Hothouse program for emerging animators. Our commitment to the exploration and development of interactive productions—a new and largely uncharted area requiring a level of risk taking and experimentation that only a public producer can achieve—was recognized by our industry in Canada and around the world. In total, 17 interactive productions, three interactive-based installations and one original installation were launched last year, while the NFB was also a double-Webby winner for the interactive doc Welcome to Pine Point, honoured in the Webart and Online Film and Video – Documentary: Individual Episode categories. Our expanding Canadian audience continues to embrace our digital offerings. In 2011-2012 the online Screening Room at NFB.ca/ONF.ca experienced close to four million views, and almost 2,500 NFB productions are currently available via computer and the iPhone, iPad, PlayBook and Android platforms. To date, NFB productions online have been viewed over 31 million times globally via our Screening Room, apps and online partner sites. The goal of serving Canadians remains at the core of all our activities. We’ve focused on becoming more fully engaged with citizens in their communities and made use of our collection and resources to generate an inclusive national dialogue. In November I completed a tour of several communities, during which I connected with Canadians in every part of the country. In all, I held 29 meetings and public events in 18 cities across Canada, personally meeting with over 700 Canadians. I was there to listen to their stories, to better understand what they want reflected in a national dialogue, and to plant the seeds for developing more sustainable community partnerships. In November 2011, in Iqaluit, Kuujjuaq, Nain and Inuvik last year, we launched one of the most vital initiatives to celebrate Inuit talent and stories that we have ever embarked on. The Unikkausivut: Sharing Our Stories DVD box set and online channel is a landmark audiovisual legacy project. It brings together new and archival works culled from the most important collection of Inuit cinema in the world—NFB films by and about the Inuit, made over a period of several decades. Through digital technology, Unikkausivut takes the Inuit tradition of passing on knowledge and culture through storytelling into the 21st century; it represents a lasting legacy for future generations, one that will help preserve the language and history of the Inuit. The initiative was developed in partnership with the Inuit Relations Secretariat (IRS) of Indigenous and Northern Affairs Canada and the Government of Nunavut, Department of Education, and with the support of key Inuit organizations. The box set was distributed free to the Inuit communities across the country. Canada’s schools and other educational institutions are increasingly connected to the digital realm, and there is a significant demand for quality, Canadian content in both official languages. In 2011-2012 we launched CAMPUS, a dedicated subscription-based portal that offers over 500 exclusive titles in addition to the NFB.ca content, as well as media tools and pedagogic aids. This online resource provides innovative ways to incorporate NFB films in the classroom and many features designed specifically for educators. We have also laid the foundations for implementing our business plan and exploring new business models. We launched the transactional capabilities of the NFB’s online platform in January 2012. Consumers in Canada and other countries can now download a copy of an NFB work and view it on the platform of their choice. In 2011-2012 we consolidated 10 digital distribution agreements with new business partners, including Microsoft, SONY, Netflix Canada, EYZ Media in Germany, Dogwoof in the UK, and, most recently, Phoenix New Media Limited for the creation of our first online channel in the People’s Republic of China. These strategic partnerships cement our leadership role in the new global digital media landscape, helping us to forge relationships and employ mobile media technology to build cultural bridges and create business opportunities. Achieving our objectives required firm discipline, regular assessments of the efficiency of our activities and innovative organizational practices. We were, indeed, recognized by the Institute of Public Administration of Canada with an Innovative Management Award, which celebrates and encourages inventive managerial initiatives in the public administration. However, our success would not have been possible without strong back-end technology to support the ability to deliver on multiple platforms. This research and development work, as well as our digitization plan, has caught the attention of several national and international corporations. As we enter the final year of our Strategic Plan, I have begun to reflect on potential directions for the future. We have, to date, focused on being a creative laboratory, doing what could not be done elsewhere while remaining committed to the principle of social relevance. We will continue to produce and co-produce pioneering works that could not be made without our participation and expertise. But we can still go much further, as we have a chance to create an institution that, through the range of its activities, can be a determinant of Canada’s changing realities by creating the context for social meaning. We can fill a void in the public sphere by making the marginal central, particularly in our national projects leading to the commemoration of Confederation’s 150th anniversary in 2017, and we can reclaim the national space in a form that is different from what it has been in the past. The National Film Board (NFB) was created by an act of Parliament in 1939. A federal cultural agency within the Canadian Heritage portfolio, the NFB exists to produce and distribute original and innovative audiovisual works that add to our understanding of the issues facing Canadians and raise awareness of Canadian values and viewpoints across the country and around the world. The NFB serves Canadians by producing rich and diverse cultural content that reflects Canada’s rapidly shifting demographic profile – content that would otherwise not be produced. Over the course of its 70‑year history, the NFB has become one of Canada’s most respected cultural institutions and an essential component of Canada’s national fabric. The NFB’s works offer vital insights into our country’s richness and diversity – and serve as an indispensable part of Canada’s cultural heritage. Since its inception, the NFB has provided an important perspective on Canada’s richness and diversity through its point-of-view documentaries, auteur animation and—most recently—new media. It has also played an important role in marking the major changes and events taking place in Canadian society. In this digital era, the need for the NFB, as Canada’s public producer and distributor, to take commercial and artistic risks that the private sector would not be able to take is more essential than ever. As Canadians’ media consumption migrates online, the NFB provides leadership in the creation of innovative digital content in both official languages and contributes to the acquisition of a broad range of digital skills that will benefit all Canadians. Making the audiovisual works it produces accessible is an NFB priority. At NFB.ca, the Canadian public and international audiences now have unprecedented access to a remarkable audiovisual heritage. The NFB serves Canadians by making its rich collection available to them whenever and wherever they want, on the platform of their choice. Furthermore, it is a trusted provider of audiovisual content to Canada’s educational institutions, in both official languages, and is a significant carrier of Canadian values to our youth. The chart below illustrates the NFB’s program activities and sub-activities that contribute to the strategic outcome. Overall, the NFB successfully delivered on priorities identified in its 2011-2012 Report on Plans and Priorities. These were aligned with the objectives of the 2008-2012 Strategic Plan. The chart below summarizes progress achieved for each priority. The NFB will exercise its leadership as a world reference point for innovation and creation of documentaries, and auteur animation, digital/new media content and other emerging forms for and across all platforms. 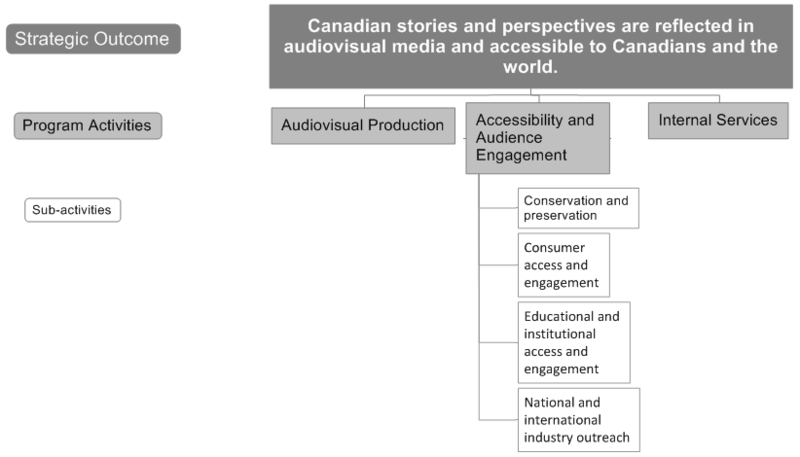 SO: Canadian stories and perspectives are reflected in audiovisual media and accessible to Canadians and the world. In 2011-2012, the NFB completed 97 original productions and co-productions, as well as 17 interactive productions (websites) comprising 146 films. This fiscal year saw the launch of three installations based on interactive productions, and one original installation. Two new iPad applications were made available to the public. 33 films, 1 interactive website, and 23 films for the Web were created by members of Official Language Minority Communities (both English-speaking and French-speaking). 51 emerging filmmakers completed a work at the NFB. 43% of the NFB’s total works completed in 2011-2012 were created by emerging filmmakers. Notable partnerships in 2011-2012 include those with: the First Nations Education Council (for Tewekan Vision, a new First Nations audiovisual production centre based at Odanak and housed in Kiuna College); ARTE France (to create Bar Code, a mobile and interactive webdoc); and the Mental Health Commission of Canada (for the original Web documentary project Here At Home / Ici chez soi). The NFB will make its works and the work of its partners readily and widely accessible to Canadian and international audiences on all relevant platforms. The NFB is continuing to enrich its programming on NFB.ca and ONF.ca. In 2011-2012, 295 productions were added in English and 274 productions in French (films, clips, trailers). In all, over 2,484 productions are available for streaming. The NFB has signed agreements with 10 new digital distribution partners, including MSN.ca, Netflix, EYZ Media and Dogwoof. Discussions are underway with Phoenix New Media LTD. In 2012, the NFB launched CAMPUS, a subscription-based online resource for educators to incorporate NFB films (and other features) in the classroom. In addition to the current offer on the education portal, a total of 509 titles were made available exclusively to CAMPUS subscribers. The NFB undertook an integrated action plan process, which identified the launch of 10 priority projects for fiscal year 2011-2012: five films and five interactive productions. This exercise is now part of the NFB’s annual planning and allows for a more effectively structured approach to marketing. By continuing to implement its digital strategy, the NFB will ensure that it can deliver on its mandate into the future: in programming, distribution, accessibility, business development and conservation of its audiovisual heritage. The first year of the digitization and digital archiving plans were completed. Over 1,200 Digital Source Masters (image and sound) and almost 500 Digital Masters (image and sound). The NFB also produced 517 mezzanine files. The first phase of relocating a number of elements for a given film began in 2011-2012. In all, about 60% of the NFB collection on film support has images stored at two or more sites. In order to deliver the digitization plan components more effectively and automate a number of workflows, the NFB put in place a project-management process based on the Agile dynamic principles to set priorities and plan and coordinate between different teams. During 2011-2012, an inventory and description of all production and distribution work processes was completed to determine the financial and technical scope of the digital Media Asset Management (MAM) program. Due to the complexity of the project, the acquisition of the system was postponed to fiscal year 2012-2013. The NFB will become a model for the creative organization of the 21st century: a flexible, efficient and effective organization that is a crucible for creative innovation, values its employees, works in a timely and transparent manner with its stakeholders, delivers value to Canadians and takes initiative in implementing environmentally sustainable practices. The Operations Committee and other integrated working groups contributed to a more effective horizontal management in NFB operations. Files included: Integrated Risk Management and Management Accountability Framework. Program branches held DigiCamp sessions, a training initiative for producers, executive producers and key creative staff. The purpose was to provide an immersive hands-on environment designed to familiarize participants with the common language, process, workflow and stages of interactive projects. Implementation of recommendations in the Management Accountability Framework for 2011-12: an action plan was created for each of the management areas. Three areas were considered priority areas: integrated risk management, management of security and information management. Considerable work was undertaken in evaluation as well. As is the case every year, an internal budget review was undertaken with a view to finding internal efficiencies to be reinvested in the NFB’s core activities and priority projects. The NFB continues to implement financial planning and control mechanisms to maximize internal efficiency; these include the measures of Budget 2010 on cost reduction as well as implementation of TBS’s Directive on the Management of Expenditures on Travel, Hospitality and Conferences. It will seek new revenue-generating sectors, optimize its partnerships in such areas as marketing, and give new impetus to its conventional distribution activities. The NFB communicated to all employees the new cost-reduction measures and changes to TBS’s Directive on the Management of Expenditures on Travel, Hospitality and Conferences. A report on annual travel, hospitality and conference expenditures was made available on the NFB’s corporate site as of March 2011. The development of new business partnerships is detailed in the “Accessibility and Audience Engagement” priority. The transactional portion of the NFB’s online platform became fully operational in January 2012. All new functionalities are now integrated into current operations. Revenues are expected to be generated throughout fiscal year 2012-2013. The implementation of a better structured and more efficient marketing and distribution strategy is detailed in the “Wide Accessibility and Democratic Engagement” priority. The NFB and its partners in the private sector are experiencing the repercussions of profound transformations in the Canadian film and TV industry. Due to the collapse of traditional broadcast models and the evolution and fragmentation of markets, fewer avenues are available for broadcast and licensing budgets have been tightened. According to Profile 20112, the total volume of documentary production dropped 11.3% to $336 million in 2010-2011. The television and theatrical segment saw a decrease in documentary production, due in part to a reduction of single-episode documentaries. The value of animated film production in 2011 was $136 million for the film and television market, its lowest level in 10 years, affecting both the English- and French-language markets. Yet online audiences are growing continuously. Canadians are among the world’s leading users of the Internet. The CRTC Communications Monitoring Report 20123 reports that over 99% of Canadian households are now able to access broadband Internet, and the demand for content, whether audio video or data, is increasing as multifunction consumer devices become available. Convergent interactive digital media production in 2010-2011 generated GDP of $46.7 million for the Canadian economy4. In this shifting environment, it is essential that Canadian content is readily accessible on a wide range of platforms. The NFB must digitize its works to avoid the risk of technological obsolescence and to ensure that the collection remains accessible to present and future generations. To this end, the NFB has developed a seven-year digitization and digital archiving plan that raises a number of technical and financial challenges. The NFB must digitize over 13,000 titles, close to 20% of which could ultimately be lost if they are not transferred to new media. Preserving the NFB collection is a challenge as well. In 2011-2012, the NFB began the first phase of relocating about 60% of its collection on film support to two or more sites. Interactive productions present some of the NFB’s relatively new preservation and distribution challenges. The features of these works differ from traditional (or linear) productions. Previously, it was often possible to convert a work to another format or medium and continue market distribution. In the case of interactive works, this type of conversion has become very difficult mainly due to the technological obsolescence of the tools used to create them and of the viewing platforms. In 2011-2012, the NFB began to consider creating a conservation plan for these works to ensure that future generations of Canadians can experience them. The NFB is continuing its transition to digital distribution platforms. It has adopted a business plan that focuses on the development of markets tied to the increase in Internet use, but also related to mobile platforms such as tablets and smartphones. In 2011-2012, the first year of the implementation of the business plan, 10 new agreements were signed with digital distribution partners. The download/purchase option was launched in January 2012, and the launch of the video-on-demand subscription service has been postponed until the start of the 2012-2013 fiscal year. A more pronounced increase in revenue in the consumer market is projected for that year. The NFB must continually find efficiencies to allocate resources where technological needs dictate. The cost of digitization, technological upgrades and rights management are a risk. As is the case every year, an internal budget review was undertaken with a view to finding internal efficiencies to be reinvested in the NFB’s core activities and priority projects. Percentage of NFB audience indicating that NFB productions reflect Canadian stories and perspectives. Percentage of audiovisual works exploring Canadian diversity. Percentage of completed productions exploring socially relevant issues. Trends in the availability of NFB works by platform. The 2011-2012 total authorities include funding for severance pay and parental leave, which is excluded from the main estimates, for an amount of $1.4 million. Of the available total authorities, the NFB is carrying forward $1.9 million to 2012-2013, an amount substantially higher than in previous years (603,000 in 2011-2012, $439,000 in 2010-2011 and $617,000 in 2009-2010), to cover the 2011-2012 retroactive salary revisions and the benefits on severance pay related to the program cut. The carry-forward will also be used to create a reserve of the funds required for the NFB headquarters relocation project. For information on the National Film Board’s organizational Votes and/or statutory expenditures, please see the Public Accounts of Canada 2012 (Volume II). An electronic version of the Public Accounts 2012 is available on the Public Works and Government Services Canada’s website7. Canadian stories and perspectives are reflected in audiovisual media and accessible to Canadians and the world. On the whole, in 2011-2012 the NFB accomplished the goals it had set out to achieve in relation to this strategic objective. In an online survey of Canadians carried out in 2012, 72% of respondents indicated that NFB productions reflect Canadian values or perspectives. The number is relatively consistent with previous years’ survey results: 71% in 2011, 69% in 2010 and 71% in 2008. 97% of productions completed last fiscal year explored socially relevant issues, up from 72% in the previous year. The percentage of completed works exploring Canadian diversity was 68%, a slight decrease from 74% in 2010-2011. This dip is explained by the large number of films (100) for the interactive project Bar Code, which was a co-production with ARTE France, a European public-service cultural television channel. Not all films for this project explore Canadian diversity. The availability of NFB audiovisual works continues to grow on multiple platforms. As shown in the 2011-2012 performance results table, NFB productions available on DVD increased 23% to reach 8,000. Productions available on the Web for streaming, downloads and mobile phones also increased by 22%. All platforms combined, the NFB increased the availability of its works to Canadians by 15%. As a public sector producer, the NFB produces original audiovisual works that reflect diverse Canadian perspectives, including cultural, regional and Indigenous, and emanate from the diverse creators and communities that make up the country. This program activity operates where the private sector doesn’t, allowing creators to explore artistic and technological advances in form and content. It also ensures the identification, development and nurturing of talent and creative skills, within filmmaking and other creative communities. NFB programming is necessary to ensure that Canadians have access to diverse voices and content in both official languages. It promotes Canadian culture and values in events of national historic and cultural significance. As Canadians’ media consumption migrates online, the NFB provides leadership in the creation of innovative digital content in both official languages. Percentage of completed audiovisual works by culturally, regionally and linguistically diverse filmmakers, Indigenous filmmakers and people with disabilities. Emerging and established Canadian filmmakers and media makers at the NFB represent Canada’s diversity and have a voice in the audiovisual world. Percentage of completed audiovisual works by emerging filmmakers (including talent-nurturing initiatives) Criteria for emerging: 1st, 2nd or 3rd film. Number of emerging filmmakers who completed an NFB audiovisual work. Numbers of participants in talent-nurturing initiatives. Events of national historic and cultural significance promoting Canadian culture and values include NFB participation. Number of productions for major national and international projects. In 2011-2012, the NFB completed 97 original productions, including 71 documentaries, 25 animated films and 1 experimental film. The NFB also produced 17 original interactive productions, along with 146 films for the Web. For the first time, the NFB created an original film-based installation (Road Movie), featured at the Toronto and Berlin international film festivals. In addition, three installations of the original interactive works Bar Code, BLA BLA and Bear 71 were successfully launched in prestigious festivals such as Sundance and the International Documentary Film Festival in Amsterdam. High-profile projects included the ground-breaking 3D work ORA with a launch of 277 screenings, The Hole Story with 490 screenings, and Pink Ribbons, Inc., which had a pan-Canadian theatrical roll-out and opened in over 30 cinemas. Lastly, 91 films were completed under the Filmmaker Assistance Program (FAP), or with assistance from the independent film support program ACIC (l’aide au cinéma indépendant Canada). The NFB collaborates with creative filmmakers, digital media creators and co-producers in every region of Canada, and in both official languages. This year, 60% of our completed original productions and 35% of our interactive productions were created by filmmakers from diverse regions and diverse cultural, Indigenous and linguistic communities. In 2011-2012, 34% of completed productions and co-productions were created by filmmakers from official-language minority communities (OLMC)—33 out of 97 original productions, and 23 out of the 146 films made specifically for the Web. As part of the Stratégie d’épanouissement et rayonnement du français, which is intended to enhance the visibility of the NFB’s French-language audiovisual heritage in Canada and internationally, the NFB commenced production of the interactive project Ta parole est en jeu Web (formerly known as Parlez-vous encore français), in collaboration with Learning Technologies Group (LTG) of the University of Moncton, and with support from the Canada Interactive Fund. Eight or nine directors from across Canada are participating in the project. In 2011-2012, shooting began on 400 short videos to be used for games. In addition, tondoc.com, a documentary website created in partnership with the Assemblée de la francophonie de l’Ontario, in collaboration with the Fédération de la jeunesse franco-ontarienne and with the financial support of the Société Santé en français, Health Canada and the Government of Ontario, was launched in October 2011. This project, which provides a forum for young Franco-Ontarians to discuss health-related issues, features 14 videos created by six directors from across Ontario. Posters and promotional items were sent to francophone schools and immersion schools as well as community and health centres in Ontario. The NFB plays an active role in the identification, development and mentorship of talent and creative skills, within both the established and emerging filmmaking communities. Emerging filmmakers created over 40% of NFB works completed in 2011-2012. Professional training was provided to 267 individuals through 19 talent-nurturing initiatives. Fifty-six of these participated in six talent-development initiatives in OLMCs. The NFB also seeks out established Canadian talent interested in experimenting with the creative application of digital technologies and interactivity in relation to story, expression and community. In June 2011, the NFB announced the two finalists of the second edition of its Cinéastes en résidence program: Carole Laganière and Danic Champoux. Beginning in September 2011, these two artists began their two-year residency to develop projects that demonstrate innovation in content, technology and distribution format. The NFB partnered with Nunavut Film to host DigiCamp, a digital/interactive workshop for filmmakers in Rankin Inlet, Nunavut. Eight Nunavut filmmakers participated in the four workshops with Web programmers, Web designers and workshop leaders. Also with Nunavut Film, the NFB launched Stories from Our Land 2.0, a new short film program for emerging Nunavut directors. It also partnered with the Yukon Film society to make new connections with emerging talent and Indigenous creators. Thirteen emerging filmmakers from Whitehorse and remote communities participated. During the workshop, participants produced five short films that later screened at the Dawson City Short Film Festival. One of last year’s highlights was the NFB’s partnership with the First Nations Education Council to introduce Tewekan Vision, a new First Nations audiovisual production centre based at Odanak and housed in Kiuna College, chaired by Alanis Obomsawin, First Nations Cultural Attaché and director/producer at the NFB. The Tewekan Vision production centre was created to strengthen the Indigenous presence in the professional filmmaking industry. Its mission is to support the creation of professional media works by Indigenous filmmakers in any format; to encourage excellence and the professional development of Indigenous filmmakers and persons working in the related professions through training covering all aspects of production; and to focus on producing independent work, over which the artist maintains creative and editorial control. Tewekan Vision also strives to promote the use of Indigenous languages in its productions. For the fourth consecutive year, the NFB celebrated the lives and achievements of the eight laureates of the Governor General’s Performing Arts Awards through the production of a short film about each of the winners. One of these shorts, Jacob Medjuck’s William Shatner Sings O Canada, became an online viral sensation, garnering over 135,000 plays by end of fiscal year. The NFB also joined forces with ARTE France to create Bar Code, a mobile and interactive webdoc allowing users to explore everyday objects as a starting point for examining who we are. Bar Code was nominated for best Digital Program – Non-Fiction at the International Digital Emmy Awards. An ongoing partnership with the Musée de la civilisation de Québec led to our participation in the new exhibition “Live Science,” taking place from June 8, 2011, to September 9, 2012. An important partnership was concretized with the Mental Health Commission of Canada for the production of the original web documentary project Here At Home / Ici chez soi. Consisting of approximately 50 short films in an interactive framework, the project will follow the lives of individuals with mental health problems in five Canadian cities, exploring some of their ongoing successes and challenges. The NFB’s commitment to the community of Fogo Island, Newfoundland and Labrador, continued to bear fruit in 2011-2012 through its participation in the community digital media art project “Living Open Source – Community Arts Media Project,” which provided people of all ages on Fogo Island and Change Islands with opportunities to create films and share their stories online. Newfoundland-based NFB producer Annette Clarke designed a training workshop for emerging talent on Fogo Island, to document the community’s participation in a unique theatre project initiated by the National Arts Centre, The Ark: Ibsen on Fogo Island. The NFB and its digital artists are being recognized across Canada and around the world for their trailblazing work; 2011-2012 highlights include two Academy Award nominations in the animated short category and two Webbys—the Internet’s highest honour—for the interactive project Welcome to Pine Point. In all, the institution garnered 105 awards and tributes at Canadian and international festivals, an increase of 32 awards from the previous year. Of those, 24% are prestigious awards, including Gemini, Jutra, Genie, NUMIX and Banff World Media Festival awards. A special Gemini Award was received for Outstanding Technical Achievement in Digital Media, as well as a Banff World Media Festival Award of Excellence in Interactive Programming. The NFB was also recognized with the Innovative Management Gold Award from the Institute of Public Administration of Canada, celebrating and encouraging innovative managerial initiatives in the public administration of Canada. Prestigious international awards included the South by Southwest Film Conference and Festival Award in the Art category for BLA BLA, the International Emmy award in the Documentary category for Life with Murder, as well as an international Digital Emmy in the Digital Program: Non-fiction category for the interactive project HIGHRISE. Animation highlights included Romance, an international collaboration with acclaimed Swiss animator Georges Schwizgebel that won the Genie Award for Best Animated Short. The NFB provides creators with a unique environment, one which allows them to produce cultural content that could not otherwise be made and push the boundaries of creativity, experiment with new technology and develop new storytelling formats. The institution now also has two core digital production studios, in Vancouver and Montreal, and the goal is to increase the interactive production capacity of all our studios across the country. In order to connect and interact with its audiences, wherever they may be, and to acquire greater exposure for its interactive productions, the NFB began creating interactive installations—both original works and others based on existing interactive productions. The installations were designed for select events and created in spaces not specifically intended to showcase art. The goal of these installations was to engage audiences in an immersive experience; as the future of the NFB lies in its relationship with the public, it is important that this relationship be considered early on in the production process, and that efforts to exhibit NFB works in public spaces are continued. Through initiatives like Hothouse, Stories from Our Land and Tremplin, the NFB continues to refine its approach to engaging with emerging filmmakers and developing strategies for sustainability. The lesson learned is that special attention should be paid to tailoring outreach efforts to different target communities, to ensure the formation of balanced and well-represented participant groups that align strongly with the varying goals of each initiative. To strengthen its approach to working with emerging filmmakers, the NFB needs a proactive strategy to reach diverse cultural communities and establish ties with other institutions. One-on-one talent-nurturing initiatives with close producer mentorship on the production of one-off short films have continued to increase in 2011-2012; this ensures that, while the number of emerging filmmaker programs may have decreased in recent years, the opportunities for emerging talent to develop their skills and produce films with the NFB will not. Over the last few years, the NFB has engaged in multi-year, multi-project partnerships with the public and private sector. Through this process, it has learned that it takes time to foster mutual understanding and build the essential foundations for successful partnerships. As a result, more lead time will be invested in developing relationships with partners and potential partners. Delivery mechanisms include the distribution, marketing and commercialization of audiovisual works via a diverse catalogue, a well‑established stock footage library, the development of diversified markets (i.e. : theatrical, television, consumer and institutional) via online and traditional channels in Canada and abroad. These activities make works widely accessible across Canada, notably to underserved and remote communities, Indigenous and Official language minority communities. Canadian and international audiences have access to and are engaged by Canadian culture and heritage. Percentage of Canadian population who viewed an NFB production. A second baseline was introduced in March 2012. Canadian audiences for all platforms combined reached 25.6 million views. This represents a 1% increase over the previous year’s 25.2 million views, as a result of significant increases in online, public screening and Mediatheque audiences, and despite decreases in television and non-theatrical audiences and the elimination of partner loans. The 30-million views target was not attained. Canadian online viewing continues to grow significantly, with cumulative combined views on NFB partner sites totalling 4.2 million in 2011-12, a 28% increase over the previous year. Views on NFB.ca/ONF.ca continue to increase, accounting for 89% of all Canadian online views in 2011-12. Canadian mobile views (including iPhone, iPad, PlayBook and Android) combined accounted for 44% of the NFB’s total online views in 2011-12, with tablets (iPad and PlayBook) representing 74% of all mobile views for the year. Canadian television audience views totalled 7.6 million in 2011-12. While this represents a 6% decline (or 511,000 views) as compared to the previous year (8.1 million in 2010-11), the decline is relatively slight when contrasted with the very steep declines seen in recent years (most notably between 2009-10 and 2010-11). Total Canadian TV output in 2011-12 was 5,326 broadcasts—the highest output on record in the past five years. Overall average audiences per measured broadcast continue to show significant year over year declines, with average audience per broadcast declining to 6,971 this year, as compared to 8,179 for the previous year. Total public and theatrical screening audiences combined surpassed the 1 million mark this year (1,075,197) representing the highest annual public screening audiences on recent record with over 9,200 screenings nationally. Public screenings generated the vast majority of these audiences (990,523). This increase is explained by a series of screenings on Parliament Hill during Canada Day, which alone generated an estimated 750,000 views. Also, theatrical screenings of Dimanche/Sunday, as well as the launch of notable titles such as Pink Ribbons, Inc., Payback and The Hole Story brought total 2011-2012 theatrical audiences to 84,674. The methodology for measurement of online international views of NFB films was established last fiscal year. In 2011-2012, the number of online views was close to 6.2 million, a decrease of 21% from the previous year. This decline is in part due to the NFB’s withdrawal from participation in the Cannes Short Film Corner competition (in order to reduce costs and allow greater focus on our Canadian initiatives), which generated 1.2 million views of NFB films in 2010-2011. In order to measure the organization’s engagement with client groups and increase consumer loyalty, new performance indicators were developed. These indicators measure the level of engagement of consumers and institutional clients (views by anonymous and registered clients), as well as the total number of international audience views for online and offline channels. New accessibility and audience engagement indicators include Internet visits and engagement with NFB’s interactive productions. Visits to NFB’s interactive productions alone totalled 1,606,750 in Canada and internationally in 2011-2012, and will be integrated within NFB audience measurement methodologies (normalized around “views”) as of 2012-2013. The NFB continued to increase its free content offerings online and promote its online Screening Room and mobile applications. During the 2011-2012 fiscal year, 295 productions (films, clips and trailers) were added in English and 274 productions in French. As of March 31, 2012, close to 2,500 productions are available for streaming online. The transactional portion of the NFB’s online platform became fully operational in January 2012. All new functionalities—such as the new government-standardized BUY button for on-demand video—are now integrated into current operations. Consumers in Canada and other countries can download a digital copy of an NFB work and view it on the platform of their choice. The business plan launched in 2010-2011 is an integral part of the NFB’s vision for the future. It identified new revenue opportunities and outlets to increase the accessibility of its products. In fiscal year 2011-2012, the NFB signed an agreement with LG for the development of an NFB film app for LG’s Smart TV. The app is preinstalled on Canadian television sets. The NFB also collaborated with Google TV to launch an NFB application for their Internet TV platform. Ten new digital distribution agreements were signed with business partners such as MSN.ca, SONY and educational services such as Alexander Street Press and EYZ Media in Germany to showcase NFB content online. Netflix Canada was also confirmed as a business partner in 2011-2012; subscribers can now stream 29 NFB titles on the portal. In 2011-2012, the NFB’s ongoing work with Inuit creators and communities resulted in the launch of the Unikkausivut: Sharing Our Stories box set and website, a landmark audiovisual legacy project that brings together new and archival works selected from decades of NFB films by and about the Inuit—the most important collection of Inuit cinema in the world. Unikkausivut was developed in partnership with the Inuit Relations Secretariat (IRS) of Indigenous and Northern Affairs Canada and the Government of Nunavut, Department of Education, and with the support of key Inuit organizations. In November 2011, Unikkausivut was launched in Iqaluit, Kuujjuaq, Nain and Inuvik. The box set was distributed free to Inuit communities across the country. In January 2012, the NFB launched CAMPUS (nfb.ca/campus), a subscription component of the NFB’s education portal. This online resource provides educators with innovative ways to incorporate NFB films in the classroom and offers features designed specifically for them. Teachers who subscribe to CAMPUS are given browsing tools that allow them to access user guides, thematic playlists and films by grade or subject area, as well as media tools that give them the ability to chapter a film and save it in a playlist with notes and comments. In addition to the current offer on the education portal, a total of 509 titles were also made available exclusively to CAMPUS subscribers. As part of the CAMPUS launch, the education team visited nine provinces and the Yukon Territory. It developed and delivered 80 workshops for 27,822 educators, with an extended reach of over 840,660 students (estimating 30 students per educator). Each workshop was customized to the needs of specific groups, many of whom had negotiated licenses with the NFB or expressed an interest in purchasing NFB content- via streaming (CAMPUS) or DVD sales. By moving its workshops to an online platform, the NFB will be able to reach many more participants across Canada. In 2011-2012, the Education team developed an online module on CAMPUS, with instructional videos and step-by-step lessons on how to produce stop-motion animation videos in the classroom. It also developed the PixStop stop-motion animation app for the iPad2. The app is designed to help students create their own short stop-motion films with ease and allows teachers to integrate the films into their curriculum. Geared to both first-time stop-motion animators and advanced users, PixStop includes tutorials by NFB experts and offers intuitive controls. During 2011-2012, the NFB was present at a variety of outreach events and tradeshows to interact with key stakeholders in the Canadian and international film and television industries. In all, 47 agreements were signed with national and international partners. The NFB took part in the 2011 editions of MIPTV and MIPCOM in Cannes, where it showcased 14 interactive projects for content and format licensing. Both events increasingly highlight digital media productions and forms of digital access, particularly through the Internet. As a result, the award-winning interactive webdoc HIGHRISE/Out My Window was licensed to SBS Australia’s website. Also in France, the prestigious Annecy International Animation Film Festival marked the 70th anniversary of the creation of the NFB’s Animation Studio, founded by Norman McLaren, with a program entitled “70 Years of Animation at the NFB: A Tradition of Innovation.” The program included 11 films that have won awards at the festival’s previous editions. Through a partnership with the Canadian Consulate General in Sao Paulo, the Centro Educacional Unificado, Zero a seis and Núcleo Espiral, two NFB staff members from the Toronto Mediatheque travelled to Brazil to give workshops on the exploration of children’s rights through digital storytelling. The workshops were based on the NFB’s Rights from the Heart series and featured discussions on media literacy, effective storytelling techniques, basic photography composition and developing creative classroom activities to complement the study of media. In Canada, the NFB partnered with key festivals in special events that facilitated knowledge exchange with key stakeholders in the Canadian audiovisual industry. Examples include the Commissioner’s address at BANFF and nextMedia, and panel discussions featuring NFB representatives at Hot Docs, the Reel World Film Festival, the DOXA Documentary Film Festival, the Toronto International Film Festival, the Ottawa International Film Festival, the imagineNATIVE Film + Media Arts Festival, the Vancouver Asian Film Festival, the Montreal International Documentary Festival (RIDM), and many others. NFB productions are preserved and digitized to ensure their permanence and accessibility to Canadians and the world. As Canadians’ media consumption migrates online, it is imperative that high-quality innovative Canadian content is available to them. Without a concerted conservation and preservation activity, the NFB’s audiovisual heritage will be compromised. In 2011-2012, the NFB began the first phase of relocating a number of elements (copies or shooting elements) for a given film. To date, 5,219 reels (1,200 cubic feet of film, or 2,050 different titles) have been transferred to a separate location. In all, some 5,000 titles, about 60% of the NFB collection on film support have their images stored at two or more sites. The digitization plan continues to be implemented. As per the above table, in 2011-2012 the NFB generated over 600 digital source masters (image) and 600 digital source masters (sound), and almost 200 digital masters (image) and 300 digital masters (sound). The NFB also produced 517 mezzanine files for its works, totalling 1,026 as of March 31, 2012. In order to implement the Digitization Plan more effectively and automate a number of workflows for which digital source master (DSM) files are created, the NFB put in place a few processes. First, a project-management process, based on the Agile dynamic principles and specifically adapted to the NFB environment and its organizational capacity, was established. Through this process, the NFB was able to set priorities, plan and coordinate the work of the different teams and deliver the digitization plan components more effectively. Secondly, an image stabilization system was acquired to ensure that each digitized image is correctly aligned in its original position. The system delivers high-efficiency gains and considerably reduces computation times. It also makes it possible to stabilize titles that cannot be processed by other means. The digital Media Asset Management (MAM) system is a component of an overall integration strategy for the NFB’s technological systems architecture. It will allow the completion of the NFB’s digital transition and make it easier to manage digital assets more effectively, as well as facilitate reuse to meet the accessibility needs of Canadians. During 2011-2012, an inventory and description of all production and distribution work processes was completed in order to determine the financial and technical scope of the MAM program. Due to the complexity of the project, the number of providers on the market and the process of selection, the NFB was unable to acquire the system in the designated timeline. The deployment of a digital Media Asset Management (MAM) system was therefore postponed to the 2012-2013 fiscal year. Despite an overall increase in audiovisual revenue of 19%, two markets suffered decreases in revenue in comparison with the previous fiscal year: Home Video (23%) and Institutional & Educational (7%). The home video market is still very fragile as the transition from hard goods to digital continues. The industry has seen a sharp decline in hard goods sales, but it has not yet been replaced by digital consumption. Institutional and educational markets in Canada decreased due to various factors, including reduced acquisition budgets for the Canadian education sector and buying practices that are changing in response to the shift toward digital media acquisition and subscription-based access to resources. 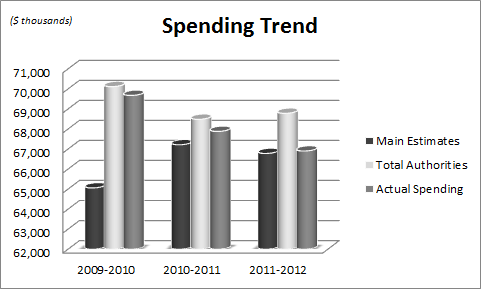 However, reduced spending on DVDs is not entirely compensated by increased spending on digital media. While the take-up in the marketplace for NFB.ca and CAMPUS is promising, the online offer is still in its infancy and the pricing still evolving based on content offering. It is hoped that the launch of the transactional components will generate significant revenue in Canada in 2012-2013. The NFB will continue to work aggressively to clear rights in order to have the largest possible offering available for that service. In terms of audience, while total Canadian views of NFB films saw a slight increase of 1% for all platforms, the target of 30 million views, set in the Report on Plans and Priorities, was not met. Despite significant increases in online viewing (28% increase over 2010-2011), delays associated with the full release and marketing of CAMPUS (online educational subscriptions) coupled with rapid declines in educational and institutional DVD sales were important factors that limited the degree of overall growth achieved in NFB Canadian audiences. The reduction in the educational and institutional market audience is also attributed to the migration of education users to NFB.ca; the inability to distinguish between an education viewing (which averages 22 people per view) and an individual consumer viewing leads to an underestimation of the number of views for the education sector. In light of this, the NFB is currently migrating its institutional users to the password-protected site to better identify an institutional user and calculate the views accordingly. Over the past four years, the NFB has made significant progress in streamlining and renewing both its creative functions and the organization itself. The NFB continued to refine its organizational structure and work methods to make the organization more flexible and adaptable to the requirements of a constantly changing environment. In 2011-2012, several changes were instituted in the Human Resources branch, including the appointment of a new department head and a repositioning of the branch to better align HR management practices with the NFB’s strategic objectives. A Human Resources Strategic Plan (2011-2014) was established and presented to all employees. One of the priorities of the plan is to implement an employee training and development structure. A comprehensive planning exercise pertaining to training was implemented and resource allocation is now an integral part of the institution’s annual planning. The English and French program branches completed their DigiCamp sessions, a training initiative designed to bring producers, executive producers and key creative staff up to speed on current trends in digital production. The sessions provided an immersive hands-on environment designed to familiarize participants with the common language, process, workflow and stages of interactive projects. Analysis and compliance with the government’s sound management requirements are ongoing processes as well as organizational priorities. The Operations Committee and other integrated working groups contributed to more effective horizontal management in NFB operations. They facilitated workflows particularly in the communication and implementation of new government policies and organizational priorities. In 2011-2012, the NFB implemented the new Policy on Internal Control. It created a detailed action plan to put the policy into effect. The first cycle of the ongoing monitoring of the effectiveness of the internal control system regarding financial reporting (ICFR) was completed by March 31, 2012. Also in 2011-2012, the Office of the Auditor General (OAG) conducted a financial audit. No discrepancies were noted. To conform with the new Policy on Investment Planning – Assets and Acquired Services, which took effect on April 1, 2012, the NFB incorporated this new form of planning into its annual budget process. A five-year investment plan for the replacement and purchase of new equipment and a forecast for professional services were completed. In April 2011, the NFB received the results of the 2010-2011 MAF assessment. This year’s observations about the NFB’s management capacity were positive overall. The Treasury Board noted the NFB’s focus during the last three years on: improvements to its governance and planning processes; implementation of a new five-year strategic plan; and refining its program activity architecture. TBS also acknowledged the solid and thorough assessment performed by the NFB as part of the 2009 Strategic Reviews. During the 2011-2012 fiscal year, efforts were dedicated to creating an action plan for each of the management areas. Three areas of management were considered priority areas: integrated risk management, management of security and information management. The NFB continued its efforts in identifying events that represent an operational risk for the organization. An internal working group drafted an inventory of risks and grouped them into subcategories. An integrated risk-management policy for the NFB is close to publication; the working group will continue its efforts over the next few months and is slated to submit the organizational risk profile in Sept 2012. The NFB has created a five-year evaluation plan, which covers all of its program activities. The plan sets out the order of priority, timetable and scope of evaluations to be carried out. In 2011-2012, the NFB undertook the following assessments: the performance of the NFB.ca online viewing space; the efficiency of its royalty management practices; and a comprehensive review of the cost of its activities designed to support the strategic review. In order to meet its business priorities more effectively and provide services to Canadians in the most efficient ways possible, the NFB has undergone a profound renewal over the last four years. Last year, the NFB’s digital shift required a repositioning of the role of Human Resources staff, from administrative experts to agents of change and strategic partners. In order to serve as a driver of excellence in HR management, the division redefined its team members’ roles and responsibilities within a new and more effective structure. The Human Resources Strategic Plan 2011-2014, the final element of the overall corporate Strategic Plan, was launched in the fall of 2011. It aims to integrate human resources management strategies and systems to deliver higher performance and higher quality services geared towards achieving the NFB’s objectives. In a context of ongoing rapid and continuous change requiring new skills, new work methods, and different forms of collaboration, the Human Resources Strategic Plan sets out a road map for the future that is central to the organization’s endeavour to be at the forefront of the global digital media revolution. In 2011-2012, the English and French Program branches held DigiCamp sessions, a training initiative for producers, executive producers and key creative staff designed to build interactive production capacity across the country. The lesson learned is that the process of building capacity is incremental and individual. In consequence, a second round of more in depth digital training is being planned and will include additional staff to increase autonomy in the administration of interactive projects (budgeting, scheduling, tracking, etc…) In addition, digital production processes have been re-organized to ensure non-specialist producers are fully supported in their interactive projects by specialist producers from the core digital production teams. Lastly, the Finance, Operations and Technology division made some minor adjustments to its structure to better respond to the needs of the NFB’s digital transition, and to allow the team to be more fully involved in the implementation of the Digitization Plan and other technology-application projects. The financial information included in this section was prepared using the accrual accounting method; it is taken from the NFB’s 2011-2012 audited financial statements. The increase in the departmental net debt is explained mainly by an accrued liability for workforce adjustment and by the increase of the provision in respect of severance pay for excluded and unionized employees. The decrease in non-financial assets is explained by the end, in 2011-12, of the three-year cycle of major acquisitions associated with the digital transition targeting new media. Thus the depreciation of equipment purchased in prior years exceeds this year’s acquisitions. Operating expenses (before severance, sick pay and workforce adjustment) were up slightly over 2010-11. This increase is due primarily to the release of digital rights aimed at achieving a critical mass of films for the launch of the CAMPUS educational site, and to the acquisition of rights for the productions Pink Ribbons, Inc. and Payback. In 2011-12, the NFB conducted more media advertising for the promotion of priority projects, including Pink Ribbons, Inc., The Hole Story, the DTO campaign and the new CAMPUS educational site. From year to year, the proportion of NFB expenditures by major activity sector remains constant. In 2011-12, marketing expenses for the promotion of priority projects completed in 2010-11 were substantial and contributed significantly to revenue growth. Efforts in the transition to new media continued with the expansion of the functionalities of our online viewing space and the new CAMPUS educational site. Audiovisual revenues rose more than anticipated in our business plan for fiscal year 2011-12. Television market revenue increased significantly, by $790,000, with the success of such films as Pink Ribbons, Inc., The Hole Story, Surviving Progress and The Chocolate Farmer, and with the full recovery of the deferred amount of $480,000 from sales of films to the Documentary Channel. Moreover, the NFB established important partnerships with the Mental Health Commission of Canada for the web documentary project Here At Home, the Assemblée de la francophonie de l’Ontario for the Tondoc.com capsules and Société Radio-Canada for the documentary and series on Afghanistan marking the 100th anniversary of the Royal 22e Régiment. Despite the decline in the institutional and educational market, it remains one of the NFB’s strongest revenue generators. The agreement with the Government of Nunavut Department of Education for the Inuit audiovisual legacy project is ongoing and has generated considerable revenue through the new Inuktitut versions of the Unikkausivut film collection. The 2010-11 revenues also include significant sales of the Talespinners box set to the Department of Education of Newfoundland and Labrador and the Work for All box set to Human Resources and Skills Development Canada. Consumer market sales decreased, reflecting the decline of traditional sales methods. To mitigate the impact, the NFB is continuing its transition to digital distribution platforms with the launch in 2012 of the download/purchase option and video on demand. Electronic supplementary information tables listed in the 2011–12 Departmental Performance Report can be found on the National Film Board’s website11. 8 – Note: The Bar Code project is a co-production with Arte France: 58 of the 100 films on the site were made by French filmmakers. To calculate this percentage, we considered only films made by Canadian filmmakers. 9 – Interactive Installations are a form of contemporary art: they are temporary, three dimensional and built into site specific physical spaces. They are designed to create an overall sensory experience including, but not limited to space, time, place and object interaction. Unlike most sculpture/art, the audience is generally required to participate with the space or objects in order to reveal the story through its interactive elements. 10 – Does not include partnership revenues, revenues from NFB centres and other miscellaneous revenues.